I love the sound of walking through good snow. There is nothing like it. As I was waiting for 11:30 when the brunch place opened, I got a surprise text from ljtourist who had read about my morning adventures and asked if he could join me. He was supposed to be in the Bahamas but his flight got snowed. The restaurant is a small little place that is lovely and comfortable and cute. Outside was a cafe table and two chairs with a big snowman in one and a little snowman in the other. They had carrot noses and olive eyes and were just adorable. We walked in and the guy greeted us with "Hi Susan! Welcome!" How can you not love that. The whole experience was just perfect except... the food. I really don't love everything on their menu. I had wanted to try their brunch. I had asked in Instagram if they were open for brunch and he had said yes. They were open but there was nothing brunchy available to eat. Frank liked his fried chicken sandwich but it is too spicy for me. The bloody mary was too spicy, too. The meatballs in my meatball soup were suburb but the soup itself as working hard to get to meh. But, hey, we supported local biz and the 'hood and our efforts were appreciated. When I got home, I discovered that the pho place up the street was also open. It would have been a much better choice and, in fact, I think I'll go up there in a bit and get some dinner to bring home. 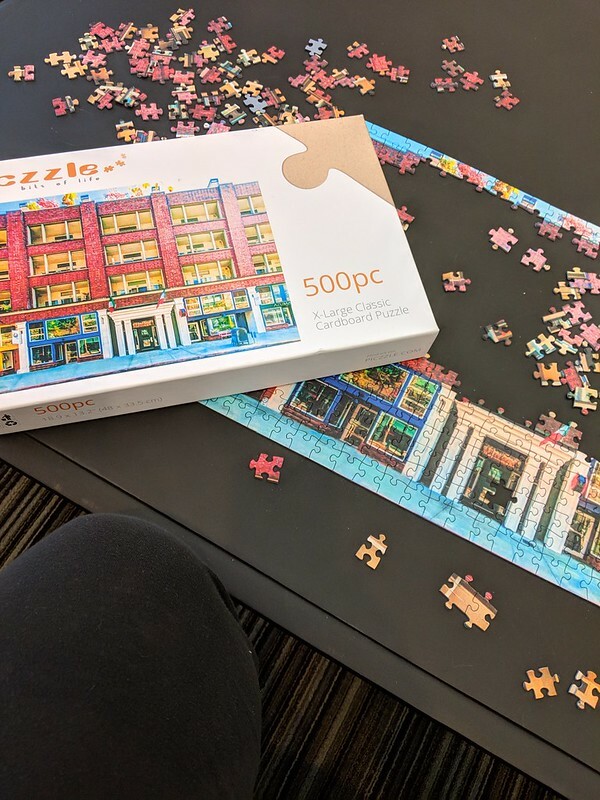 A couple of years ago, we started having jigsaw puzzles in the lobby of our building. They are fun to share and particularly nice when you are stuck down there waiting. I saw there was a new one but didn't pay much attention to it until today. I went down to be there when Frank got here and discovered that this current puzzle is one that someone had made of the front of this building! What fun! The sun is out now and it's so lovely with the snow. They are saying 1-3 more inches tomorrow night. And then, on Tuesday, we are on track to get a repeat of yesterday/last night. Real snowpocolypse!! I may never get to the pool again. I've decided not to worry about it.